This summer the inaugural boutique festival Hope & Glory is taking over Liverpool’s city centre, hosting an array of live music and entertainment across the weekend of the 5th and 6th of August. Hope & Glory is a unique, artistically subversive event offering an edgy, sophisticated and surreal experience, marrying together the ideas and stylings of Charles Darwin with Tim Burton. Following the news that the 70-piece orchestra Hacienda Classical will be closing the festival on Sunday, Manchester band James have now been confirmed as the Saturday night headliners and will be joined on The Great Exhibition Stage by Razorlight, The Fratellis, Charlotte Church’s Late Night Pop Dungeon, The View, Embrace and many more. Newly added to the Wonders of The Age Stage, Starsailor will close Saturday nights mayhem with the likes of Lucy Spraggan, Dave McCabbe (Zutons) with Ian Skelly (The Coral), The Seahorses lead singer Chris Helme, The Ordinary Boys and more playing throughout day. On Sunday, Haçienda Classiçal will be joined by special guests Shaun Ryder and Bez from the Happy Mondays with Tim Booth from James also now featuring, whilst Ocean Colour Scene will also now be playing The Great Exhibition Stage alongside Tom Chaplin (Keane), Lightning Seeds and musical troubadours Public Service Broadcasting. 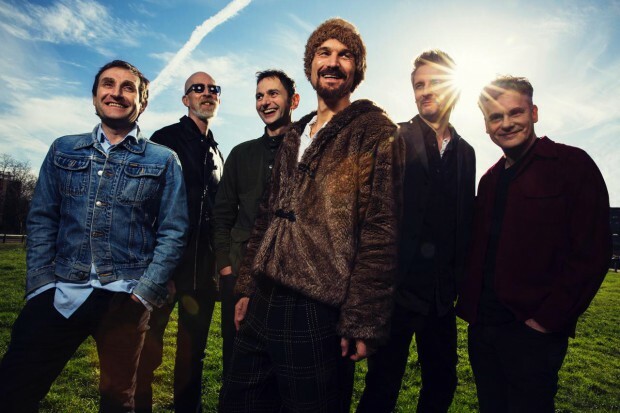 The Twang will champion a day of new music with The Shimmer Band, The Blinders and others take to the second stage, before the afore-mentioned Haçienda Classiçal bring main stage proceedings to a rousing end. The festival is set behind St. George’s Hall, in St John’s Gardens and William Brown Street where 12,500 fans can enjoy the festival while indulging in the stunning Victorian backdrop of the World Museum and City Library in a specially created arena – all within a few hundred yards walk of the main Lime Street train station. As a special treat for early-bird purchasers, the first 1,200 ticket buyers will have the option to attend an exclusive free gig the night before the festival starts. Taking place in a secret location in Liverpool on Friday 4 August, the exclusive gig will have big name acts performing; details of which will be revealed to the lucky ticket holders nearer to the event. Hope & Glory also features an abundance of entertainment across the site with Spoken Word performances, magic shows, comedy and acoustic acts plus extravagant and outrageous side-shows and so much more fun for the whole family to enjoy. The changeover on stages will be occupied by Ultimate Power and Propaganda DJs. Over on the ‘In The Lady Garden’ Stage, this will be featuring spectacular entertainment including Football Legends charity darts match, Charlotte Church in conversation with renowned journalist Simon Price, Celebrity Charity arm wrestling, The Victorian Acrobatic Team, The Liverpool International Air Guitar Competition, Harminder the Elephant, Dinosaur Baby in the Pram, Dance of the Lobsters and The Woman Who Grew Up Into A Tree. Additionally, over the course of the weekend and throughout the festival site, there will be a Foam Party, Prince Albert’s Little Secret (Cocktail bar), Mothers Ruin (Gin bar), Mr Edison’s Electric Emporium, Dr Johnson’s Clandestine Gathering, The Hoop & Stick, Darwin’s Little Darlings, Stephi La Reine’s Fashionista Hour and more. 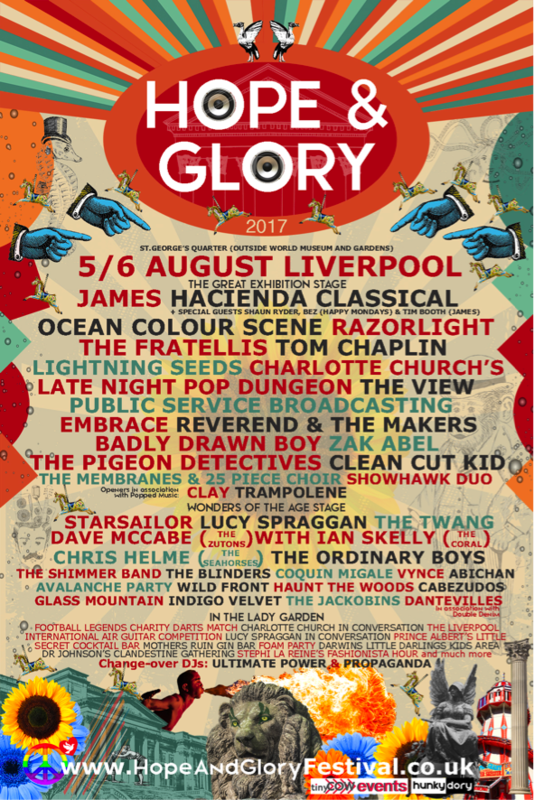 Hope & Glory is an exciting addition to the UK’s festival scene, providing a quirky and fun weekend for all the family to watch, enjoy and discover some of the best talent in music and art, all within a unique and attractive location.